In Colorado, this version of wine country exists on the western slopes of the Rocky Mountains in the Grand Valley AVA and around the North Fork of the Gunnison in and around the West Elks AVA. However, almost half of the state’s wineries are actually located on the Front Range, in and around Denver. These wineries are spread out over 175 miles between Fort Collins and Cañon City. This can make tasting the wines of more than one winery an arduous task. Luckily, in the interest of building a better wine country experience in this area, four entrepreneurial artisan wineries are collaborating in what they call Colorado Winery Row. 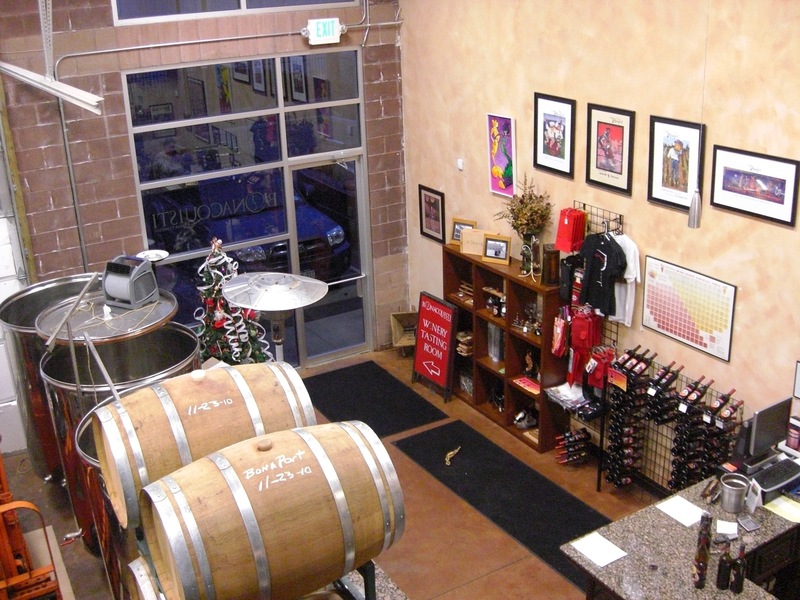 Bonacquisti Wine Company was started in 2006 by Paul Bonacquisti, owner and winemaker, using a 2,500 square-foot industrial condo space just south of I-70 in Denver’s popular Highlands neighborhood. Entirely within this intimate urban setting Bonacquisti squeezed his tasting room, barrel/tank room, storage, and a chic loft where guests can mingle and look out over the winery. 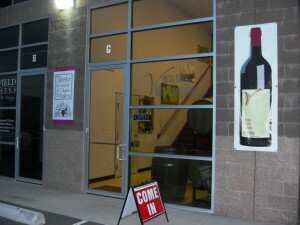 In the summer of 2009, Verso Cellars opened a warehouse and lofted tasting room two doors down from Bonacquisti. 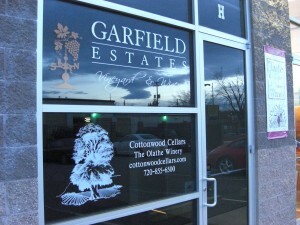 Then, in March of 2010, two more wineries, Garfield Estates Vineyard & Winery and Cottonwood Cellars/The Olathe Winery, opened a joint tasting room between the two existing producers. With this critical mass of wineries, Colorado Winery Row has become Denver’s top urban wine tasting destination. “Our goal is to make Colorado wine more accessible and visible to the consumers on the Front Range,” said Carol Carr, owner of Garfield Estates. Each winery brings a different style of wine to the group. Bonacquisti specializes in red blends with a focus on Italian varieties, such as the popular Sangiovese-dominated Vinny No Neck, named after his 6-yr old son Vincent. He also produces a few whites in small quantity with limited availability. Bonacquisti is also one of the few wineries to have his wines offered on tap at area restaurants. Contrastingly, Verso Cellars makes only one wine, a single-vineyard Cabernet Sauvignon. Using six different cabernet clones each year offers an interesting vertical tasting experience, highlighting each vintage’s characteristics. Garfield Estates produces wines using estate-grown Rhône and Bordeaux varieties. “In Palisade, it is all about the dirt and the farming. Here, we feel that we bring a little bit of the western slope to the folks in Denver,” Carr proudly proclaimed. Cottonwood Cellars/The Olathe Winery provides two different levels of wine. The Olathe Winery offers more fruit-forward, sweeter wines whereas Cottonwood Cellars represents more traditional-style full-bodied wines. Their estate-grown Lemberger is a unique offering that few other Colorado wineries provide. Neighbors and tourists alike are sure to find a wine that fits their palate amongst these wineries’ offerings. The collaborative nature of Colorado Winery Row allows for events that would not be as successful at a single winery. With just one summer in business, as a group “we’ve had some successful events together,” declared Bonacquisti. Fridays Uncorked, a monthly concert series which features local musical acts, is the showpiece attraction as the wineries create a mini festival in the parking lot every third Friday. Bringing in local mobile food icons Gastro Cart and The Denver Cupcake Truck has also been successful. While the wineries also hold successful individual events such as birthday parties, wedding receptions, and corporate events, Paul Phillips of Verso Cellars suggests that collectively they can do even more. Bingo, Bunco, and book clubs offer an untapped potential for community events to pair with Colorado wines. Additionally, each winery showcases a rotation of artwork and crafts from local artists. And of course local wine club members love opportunities to stop by and pick up their wines and interact with the owners rather than receive their allocation via a drab cardboard box in the mail. In the short time that I spent talking with Paul Bonacquisti, two enthusiastic wine club members strolled through the door and listened intently as Paul proudly described this month’s selection, which included the 2007 Merlot only available via the wine club. While Verso, Cottonwood, and Garfield all have their winemaking facilities and vineyards on the western slope, they welcome the opportunities that this urban location provides. Carr stated, “we actually get quite a bit of ski traffic from skiers returning to Denver via I-70.” Paul Phillips also acknowledged that his Colorado Winery Row location is doing better business than his tasting room at a downtown coffeehouse. The easy accessibility is a top draw for those who do not want to drive from winery to winery along the Front Range or battle mountain traffic on the way to the western slope. Phillips cited local wine-themed tour groups, such as 5280 Wine Tour CO, as being responsible for bringing in a lot of tourists via bus and limo service. Carr also noted that the occasional airport shuttle stops for their customers en route to and from Denver International Airport. Despite the non-traditional winery atmosphere, all of the wineries are pleased with their partnership and their location. “I embrace it; being an urban winery. 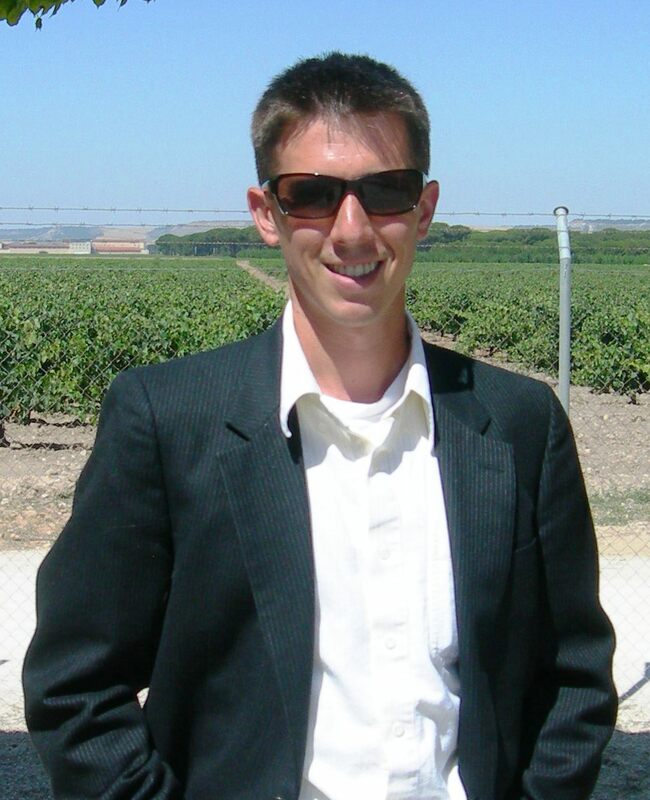 I let the growers grow so I can concentrate on winemaking,” affirmed Bonacquisti. 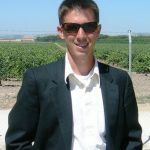 While there is no plan to expand with additional wineries, don’t be surprised if in the future other Colorado wineries want to join in on the fun in north Denver. Colorado Winery Row is conveniently located off of I-70 at the Pecos exit in the Highlands, just minutes away from downtown Denver. General hours of operation are Thursday, Friday, and Saturday from 1 – 5 pm. Visit Colorado Winery Row for a calendar of events and further information. I would love to go here, but the hours of operation are pretty exclusionary! Is there any way you could stay open a little later on a Friday night, or possibly be open on Sat. afternoon? I would come in a hearbeat – and bring lots of wine drinking friends!